The Mississippi River, America�s watery highway, has seen more than its share of riverboat accidents, what with the many ways a ship could meet its end. An overworked boiler might explode, showering the flammable wooden boat, its cargo, crew, and passengers with burning coal, white hot shards of metal, and scalding steam. A snag might rip out the bottom of the hull, sending a boat plunging to the muddy bottom of the powerful, roiling river. And then there is the constantly changing channel of the river itself, ready to throw up a new sandbar to catch a careless river pilot unawares with a shallow stretch of water, or a new bypass where there once had been solid land. 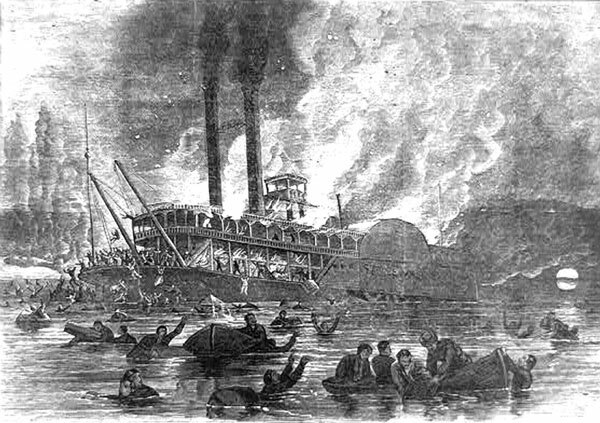 Shown in this wood engraving, the steamer Stonewall burns on the Mississippi River on the night of October 28, 1869, with a loss of about two hundred passengers — one vivid example of the dangers facing a steam boat plying the waters of the Western Rivers. that has no clear cut explanation as to what really happened, although some may claim otherwise. In March of 1882, the stern-wheeler Iron Mountain was moving barrels of molasses and four barges laden with cotton up river�by some accounts down river. 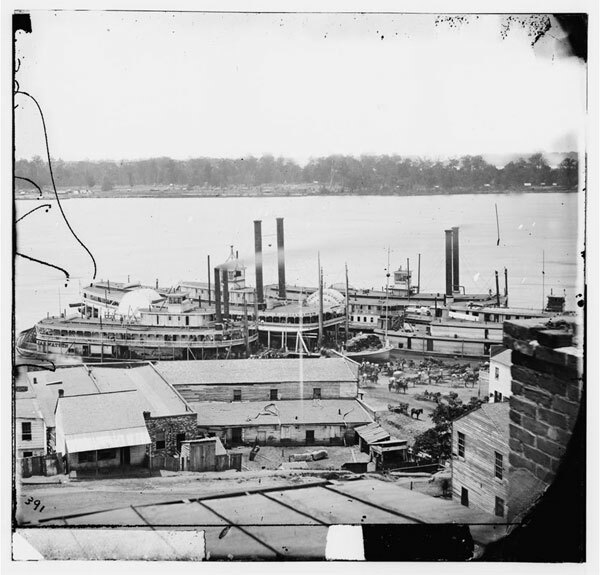 She docked at the river city of Vicksburg, Mississippi to take on supplies before continuing on�an uneventful trip so far�one of many. The Iron Mountain was afloat for only ten years when she sailed into the world of the mysterious, or at least the curious. One hundred and eighty-one feet long, thirty-five feet wide, and about ninety feet tall from her shallow-draft keel to the top of her twin smoke stacks, the Iron Mountain was not a small steamboat by any stretch of the imagination. And she had been only ten years on the river, having been completed in 1872 on the Ohio River at Pittsburgh. Constructed for Gray�s Iron Line, she was the first steamer on the inland waterways of the Western Rivers (as the Mississippi and her tributaries were called then) to have boilers made entirely from steel. Prior to this, all steam ships� boilers were made from cast iron. There were five of them, and each boiler measured forty inches in diameter and were twenty-six feet long, with a pressure output of one hundred and seventy pounds per square inch of live steam. There are several versions as to what happened on that voyage. 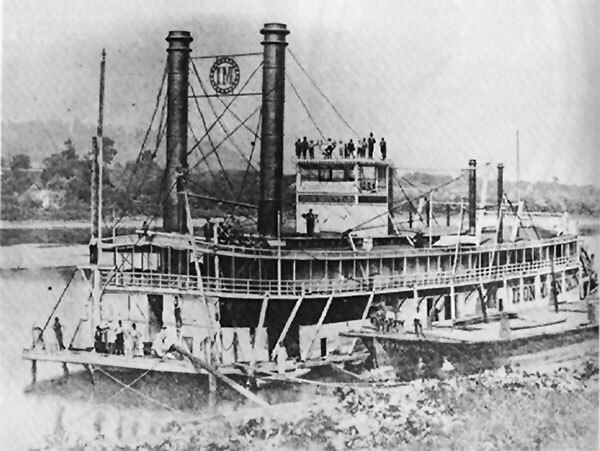 Fifty-five passengers and crew were onboard, and two hours out of Vicksburg another steamer, the Iroquois Chief, came close to meeting her own end when she almost collided with the four barges that the Iron Mountain had been towing. They were drifting with the current, clearly a hazard to other ships, clearly an indication that some accident had befallen the Iron Mountain for her barges to be running loose on the river this way. Some say she struck an obstruction in the river and sank quickly, taking all on board down with her. Others claim that the lines holding the barges had been deliberately cut, a sure sign of a problem. Yet another account has her starting to sink, and passengers and crew seeking safety on the barges she was towing. In some stories, the vessel disappeared completely, swallowed up by the mighty river. Other reports of minor pieces of wreckage having turned up on the Louisiana side of the river are common. River pirates also come into play�it is speculated that they boarded the steamer and killed everyone aboard. A current theory blames the boat�s disappearance on a �time slip,� a rent in the fabric of space-time. Sounds more like a rent in the fabric of logic! The riverfront at Vicksburg, Mississippi, where the Iron Mountain was last seen, was a busy place in the late 19th Century. Almost one hundred years later in 1977, the Army Corps of Engineers published a booklet entitled �Historic Names and Places on the Lower Mississippi River.� The Iron Mountain accident is included and the fact that this occurrence generated several of the above mentioned legends is discussed. According to the booklet, the steamer did run upon a snag, and passengers and crew made it to safety as the boat started to sink. When a group of the boat�s officers went to check on the wreck the following day, they could not find it. The Iron Mountain had indeed vanished! But not for any arcane or mysterious reasons�the boat had simply floated downriver. This loss was reported and the officers and crew found themselves positions on other steam boats. A couple of months later, the Iron Mountain was located. 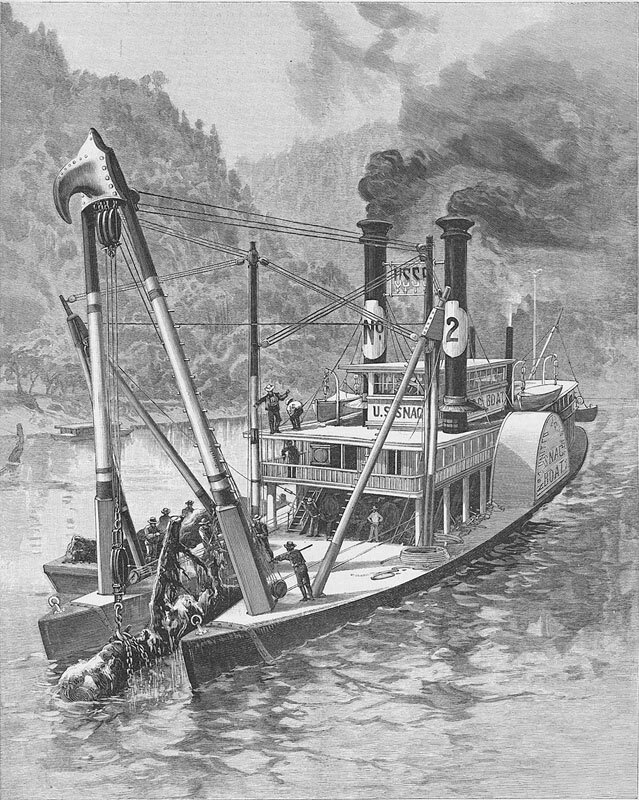 Apparently, as a result of the 1882 flood, the wreck of the Iron Mountain had been carried through a break in a levee on the Louisiana side of the river near present-day Omega Landing and deposited in the middle of a field by the receding flood waters! This explanation certainly clears up the mystery of the disappearance of the Iron Mountain. But it also brings another one to mind — how is it possible that, for several months, no one spotted a one hundred and eighty foot long Mississippi River steam boat sitting in the middle of a flat field?! Known as �Uncle Sam�s Tooth Pullers,� U.S. Army Corps of Engineers snag boats made the waterways of the country safer by removing trees and other debris that littered navigable rivers. U.S. Snag Boat No. 2, the Heliopolis, removes a tree trunk from a river channel in this engraving.